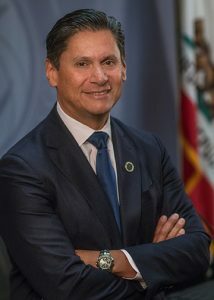 Eloy Ortiz Oakley, chancellor for the California Community Colleges (CCC) has been announced as Golden West College’s 50th Anniversary Commencement Keynote Speaker. A former GWC student himself, Oakley returns to his roots to share his experiences with this year’s Golden West graduates. After serving in the U.S. Army for four years, Oakley attended Golden West College before transferring to UCI where he graduated with a bachelor’s degree in Environmental Analysis and Masters in Business Administration. He went on to serve as vice president of college services at Oxnard College; manager of risk services at the Coast Community College District; adjunct faculty member teaching in and coordinating the Environmental Technology Certificate Program at Golden West College. Oakley joined the Long Beach Community College District in 2002, serving as assistant superintendent/executive vice president of administrative services. He was appointed as the superintendent-president of the LBCCD in 2007. Oakley has worked hard to foster strong relationships with members of the community, state and national policy leaders, his Board of Trustees and the faculty and staff of the college.